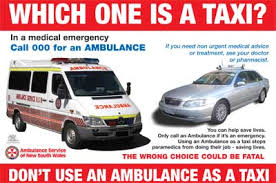 Ambulance Taxi Service -Have You Heard Of It? You will likely never guess, so I’ll just tell you. The ambulance taxi scam is something that Somalis refugees in Lewiston, Maine figured out as a way to get transportation downtown ~for free. They call up with back pain which magically disappears when they reach downtown. Apparently it’s a common abuse with Medicaid recipients too, but I first learned about it from an article on American Thinker. There are examples of refugees, also Somalis in this case, but it could have been any refugee from anywhere, turning kitchen cabinets into chicken coops, slaughtering goats inside throwing carcasses in the back yard to rot, jammed up toilets, etc. The point is these people are not, nor are any refugees or immigrants today taught to assimilate. Sadly, they are taught to game the system. The State Dept. brags that America currently takes more refugees from the world’s ghettos than all other refugee resettlement countries in the world combined. These people as well as all the illegal aliens flooding over the southern border are resettled by taxpayer-funded “Voluntary Agencies” or VOLAGs, all of which are in it for the m-o-n-e-y (close to a billion dollars annually, so hey, why are they called voluntary?) with top staff making high six-figure salaries. Following their prophet’s established example these mostly Muslim refugees are driven first to colonize and then to transform non-Muslim target societies destroying our civilization from within advancing their ultimate objective – global submission to Shariah. All of this aided by the American Left and especially the Obama administration. Folks we have to nominate and elect a constitutional conservative candidate for president next year or it’s all over. Help pass liberty on to the next generation. This entry was posted on Tuesday, June 16th, 2015 at 9:43 am and is filed under Updates, WTF?. You can follow any responses to this entry through the RSS 2.0 feed. Both comments and pings are currently closed.